Front Of House is a gallery for site-specific installations, in the entry to the JHID office. The space is housed in a historic brick building from the 1880’s, with very high ceilings, white walls, maple floors, and huge windows facing out towards Portland’s 1st avenue, which is a major line of Portland’s MAX light rail train. 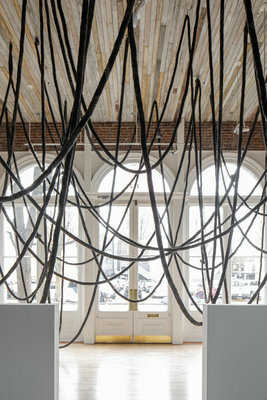 One artist at a time is invited to create a piece which responds to the physical possibilities and constraints offered by the space, with the only requirement being to allow for passage from the front door to the office entrance. The relationship between the gallery and the design office is an exciting one. As designers, our job is to create spaces or respond to existing spaces, but our creativity is necessarily enmeshed in many layers of practicality and function. Working in close proximity to a beautiful empty space and having the chance to see how one artist after another responds to the space without those layers of constraint liberates us, and sparks our creativity. We hope that it will have the same effect on all those who pass through the space.